2. Song Without Words, Op. 62, No. 1 "May Breezes"
Violinist Mischa Elman performs compositional works by Dvorak, Mendelssohn, Smetana and more, accompanied by Joseph Seiger at the piano. Mischa Elman, who was born at Talnoy, Kiev, made his first public appearance as a violinist at a village concert when he was five years old. His prodigious talents soon came to the notice of Leopold Auer, who adopted him as a pupil at St. Petersburg in 1901. 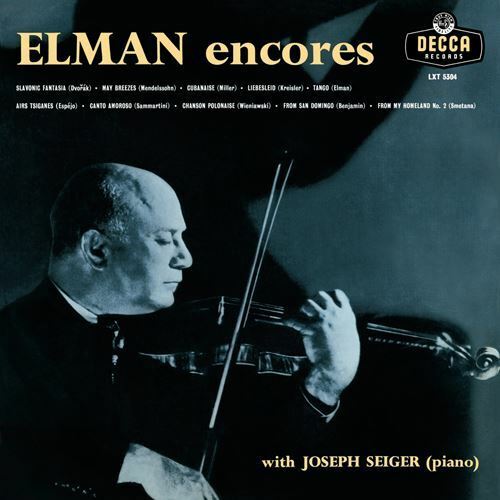 Elman's Berlin debut took place in 1904, with immediate and outstanding success, which was repeated in the following year on his first appearance in London when he played the Tchaikovsky concerto at the Queen's Hall. With this same concerto, three years later, he introduced himself to America (New York, December 1908). Since then he has been recognized as one of the world's foremost violinists, and is particularly renowned for his beautiful tone and technical mastery. In the present recording, Mischa Elman presents some of the shorter pieces with which he has captivated audiences all over the world.